"Acer S Series monitors are very slim yet spacious displays that are great for multitasking and web browsing. High-def visuals leap to life thanks to Full HD resolution and an extremely high contrast ratio. You'll appreciate both the imagery and the look of this streamlined yet powerful Acer monitor!" 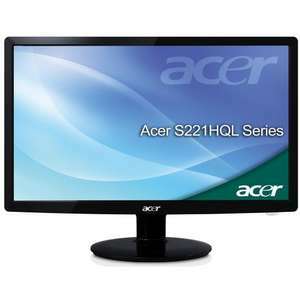 Product Description: Acer S221HQLbd - LCD display - TFT - 21.5"
From Acer Direct at £114.97, though free delivery is within 10 working days. Worth getting Amazon to price match!! How does this compare with the BenQ G2222HDL? I looked like that after playing the AR games on my 3DS. Seriously though i could use a new monitor. £91.97 from Amazon now (Not marketplace).